Each day I try to notice and wonder more when I go outside but yesterday was a busy day. I spent most of it indoors preparing for a professional development workshop and later in the day working with my painter who is refreshing different rooms in my house. 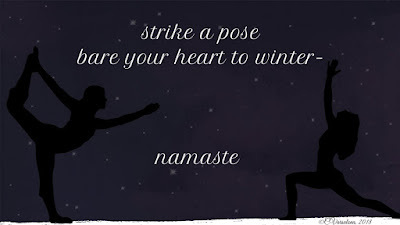 For a quick diversion, I designed an indoor space to wonder about winter. How did I do that? Virtually, of course! I took several steps and used my appsmashing abilities to carefully add layer upon layer to a Buncee Board on my computer. 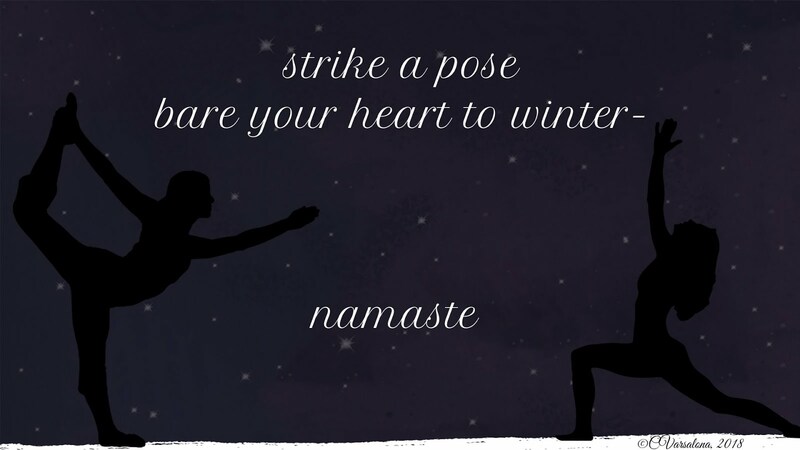 The outcome was the creation of an #imagepoem, a virtual winter day with dancing snowflakes. If you take a look at my animated Buncee you will see what I mean. You can find it here. In between work-related tasks, I had fun digitally designing. Would you like to take a look into my process? -First, I found a photo of clouds in Florida taken by my Twitter friend, Valerie Tilton. 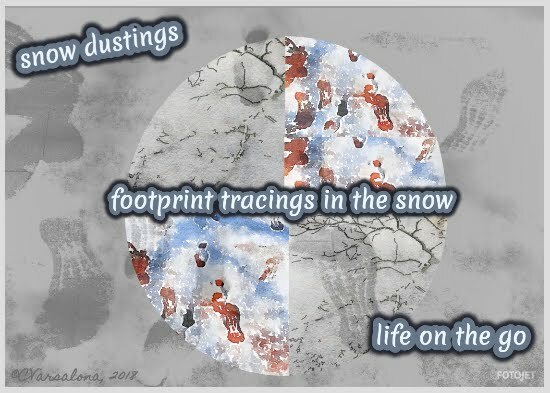 -Opened my Buncee dashboard and started creating: used the original photo of the clouds as my background; inserted my digital poem; added music; created a plaque greeting the snowy day; animated the image with falling snow. -Traveled over to Wonderopolis and found Wonder of the Day #79 to add for content onto the Buncee platform. -Constantly reflected after viewing each part of the digital. 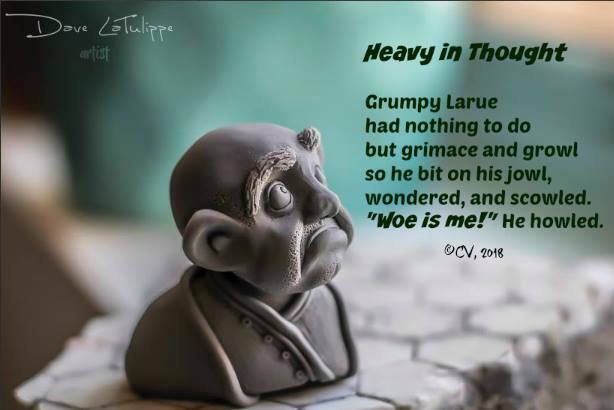 -Sent the Buncee out to Facebook and Twitter for feedback. 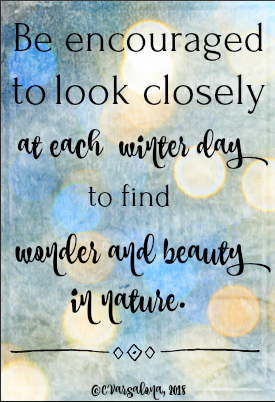 Enjoying winter as a season of recovery and preparation, allowed me time to notice, wonder, and discover the magic of digital tools to enhance my indoor winter world. Perhaps, you would like to have some digital fun like I did. 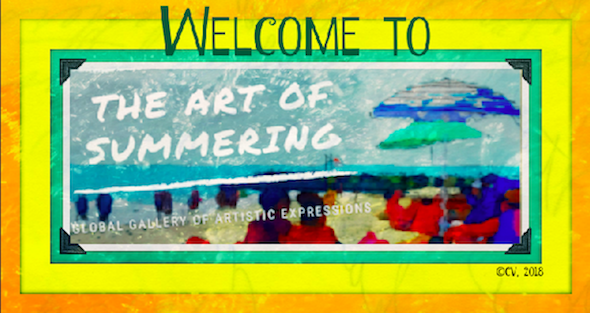 You still have a couple of days to create your own digital inspiration for my Winter Wonderland Gallery of Artistic Expressions. The invitation and guidelines can be found here. Enjoy life today! I'm off to do so on this sunny winter day. 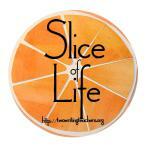 Today is Slice of Life Tuesday at Two Writing Teachers. I am joining them here. This was a week of questioning, writing, and reflecting on finding my greatness after a rousing shot of inspiration at Monday night's #NYEDChat convo. My esteemed colleagues, Laura Robb, Dr. Mary Howard, and Evan Robb, guest moderated the Twitter chat while Dennis Schug and I manned the moderator desk. There was an amazing flow of spirited conversation throughout the convo and an immediate rush of excitement. Positivity was in the air. Yes, it was a night to remember. I was riding the high waves of life but sometimes, after a thrilling experience a flatness occurs. Exhaustion takes over and questions start popping up. "Where am I going? I must slow down. 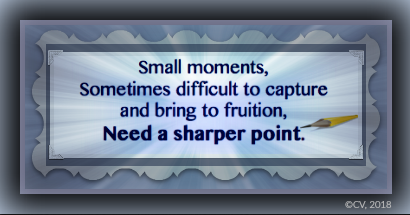 Remember that small moments matter." I spent the rest of the week subconsciously searching for the greatness of inner strength to flow like a fountain. Some of the days, the flow was scarcely enough and my writing got many false starts. Other days, thoughts were in the form of rewrites for the 6th Annual February Poem Project, the brainchild of Laura Shovan. Buncee Animated original is here. I may have needed a sharper point but I persevered and embraced hope. It is time to Celebrate This Week with Ruth Ayres. Ruth has a wonderful story to share about her son moving onward with a resilient spirit. It's Poetry Friday! Elizabeth Steinglass is hosting and offers a "Why I'm Here"
poem for us to read plus an invitation to design one. Travel with me to Liz's site. The countdown began early in the day. By midday, the momentum built up. Questions were loaded on TweetDeck and a fast flurry of pre-chat thoughts shared. Our stellar team of educational friends, Laura Robb, Evan Robb, and Dr. Mary Howard, were ready to rock Twittersphere with burning questions and a topic for all, "Find Your Greatness". As the hour drew near, colleagues began sending tweets and tagging friends to join the convo. Then, the magic happened. 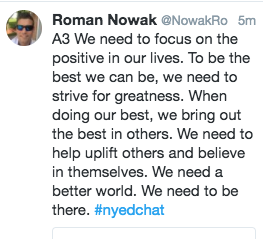 I opened the doors to #NYEDChat and a tribe of tweeps, full of energy, gathered together in a virtual hall of conversation. 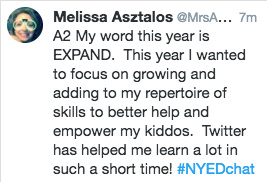 For veteran tweeters and newbie chatters eager to grow as learners, nothing can match a virtual professional conversation for its depth, passion, collegial spirit, and instant shot of positivity. Let's take a look into the inner workings of an hour-long chat on Twitter. 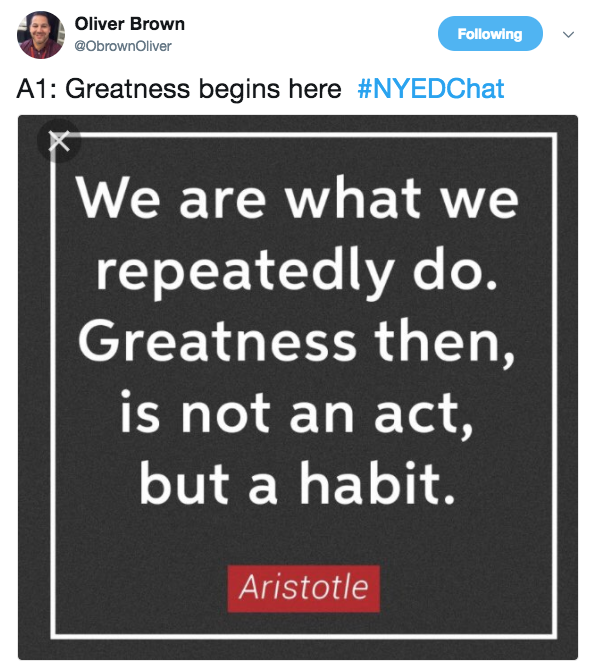 When visiting #NYEDChat be prepared for a fast-paced experience filled with greetings, quick responses, sidebar conversations, and beneficial, asynchronous professional development delivered to you in the warmth of your home. Topics are key and vary, professional learning a given, and growing a professional learning network a plus. 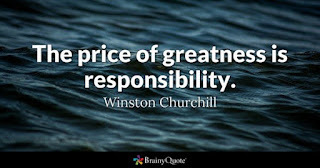 Teamwork by a supportive and inviting group of connected colleagues who value and honor voice is evident. Everyone leaves the chat with a feeling of euphoria, a layer of new knowledge, new friends to chat with in the future, and an action step for the following week. Now let's dig deeper and see what transpired at last night's chat. Within five minutes of the opening remarks, Dennis Schug and I, along with our panel of all-stars, watched as comments, like fireworks split in the air causing a rush of excitement. 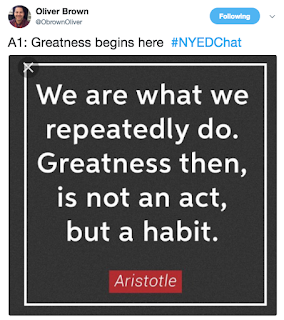 The news of #NYEDChat's trending on Twitter propelled a continuous flow of voices being raised across social media. 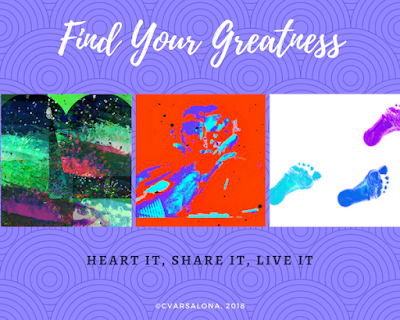 Find Your Greatness tidbits of wisdom were shared along with one words to guide professional and personal journeys. 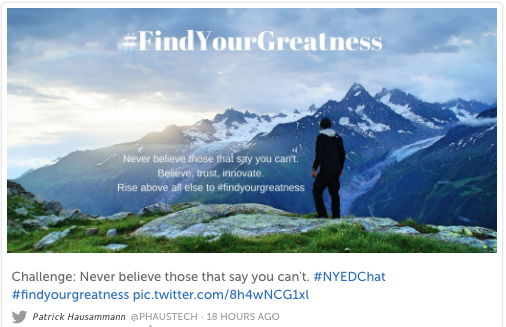 The hashtag, #FindYourGreatness, was the spark for a stream of questions and amazing responses. 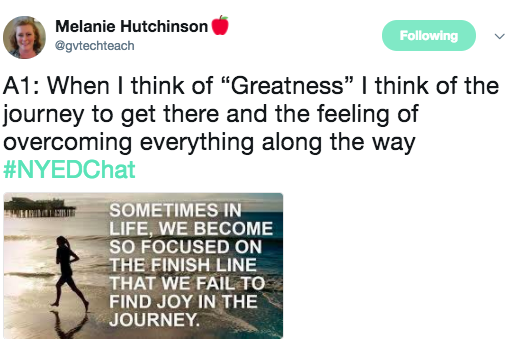 It was heartwarming to see so many colleagues from different roles come together to exchange comments on the hows and whys of their journeys to find their greatness. 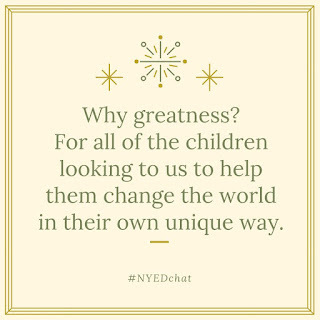 For two hours after the airing of the convo, #NYEDChat was one of the top trending chats on Twitter. The conversation was filled with many memorable statements. Mary Howard was so excited by the awesomeness of the conversation that she storified the chat immediately. 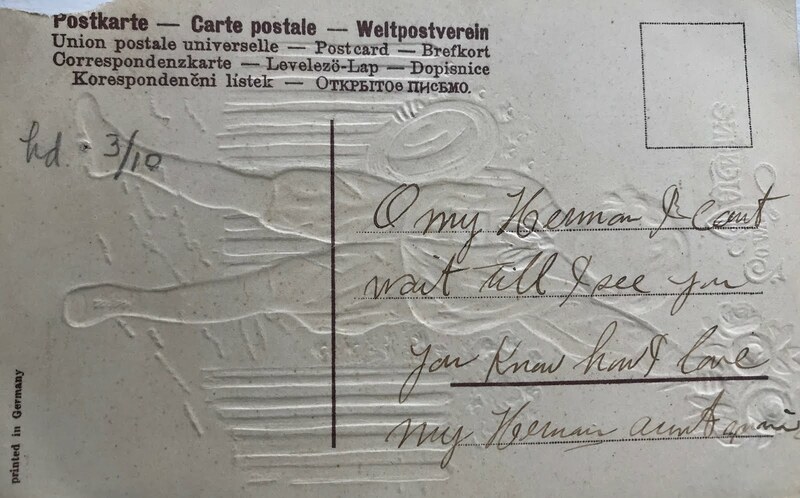 You can read that here. Participate partners with NYEDChat and also created a transcript of the chat. You can access that here. 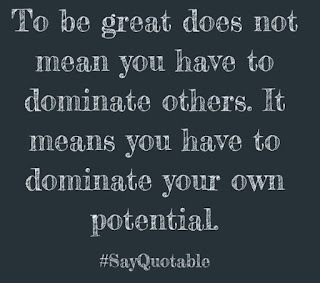 Greatness is something to strive for. The challenge to pursue greatness is so motivating. You can see Brent's Pe-Chat blog post here. The guest moderators and moderators were all excited that Brent had the enthusiasm to post before the chat. 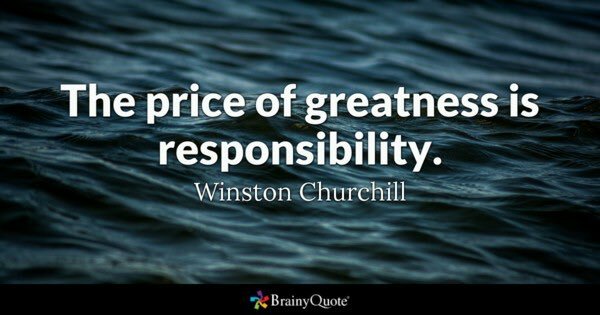 Greatness evokes a desire to serve students, teachers and parents. Great to be here tonight. 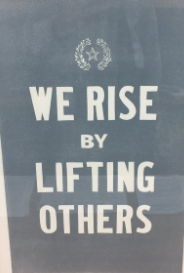 Lift others up and find the greatness that is in you and those you go through life with. 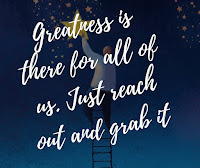 Greatness means that we have left our thumbprint on those around us in some way that will live beyond ourselves and enrich the lives of others. Question 2 reminds me that each of us are on our journey. 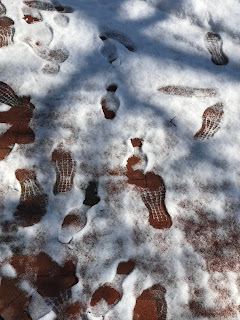 I love and respect that our personal own journey can converge with the journey of others. 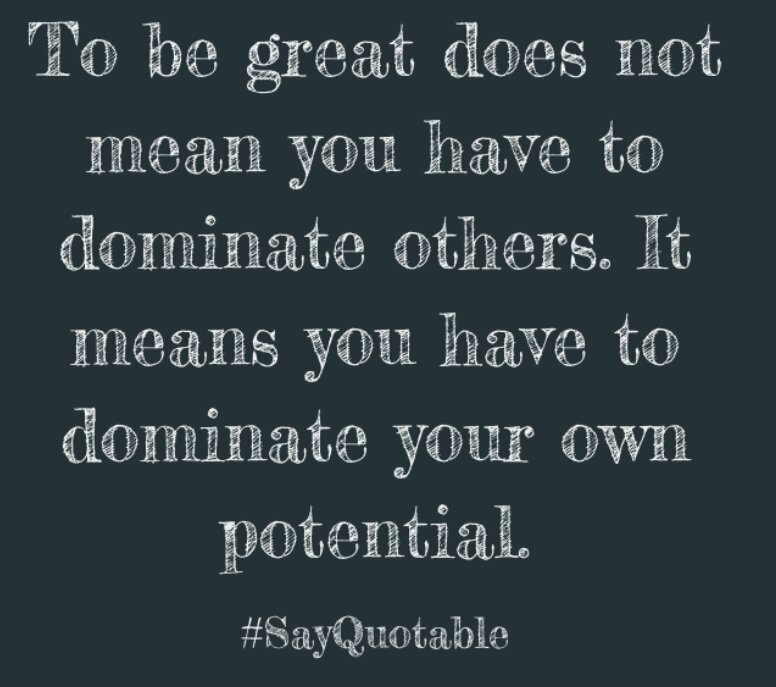 Greatness was never meant to be a lonely proposition. I love that we can do it in the company of others. An honor to be here tonight with this dedicated and inspiring group of educators. 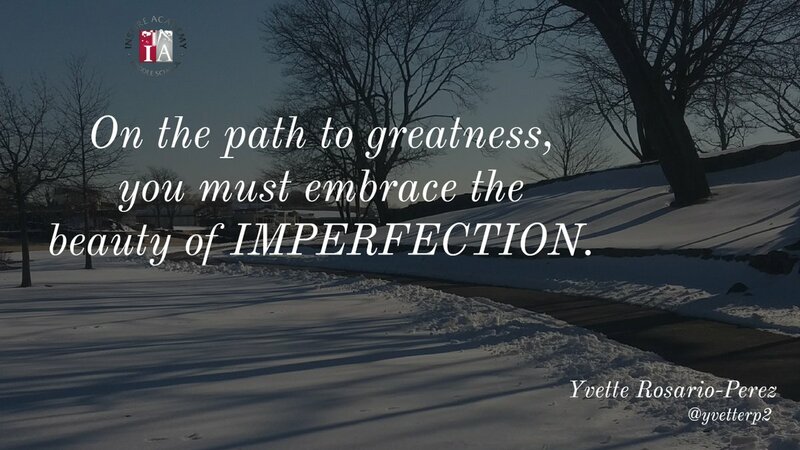 Keep striving for greatness through your work and learning with others. Thanks to Dr. Mary Howard, Evan Robb, Carol Varsalona and Dennis Schug. Memorable chat! 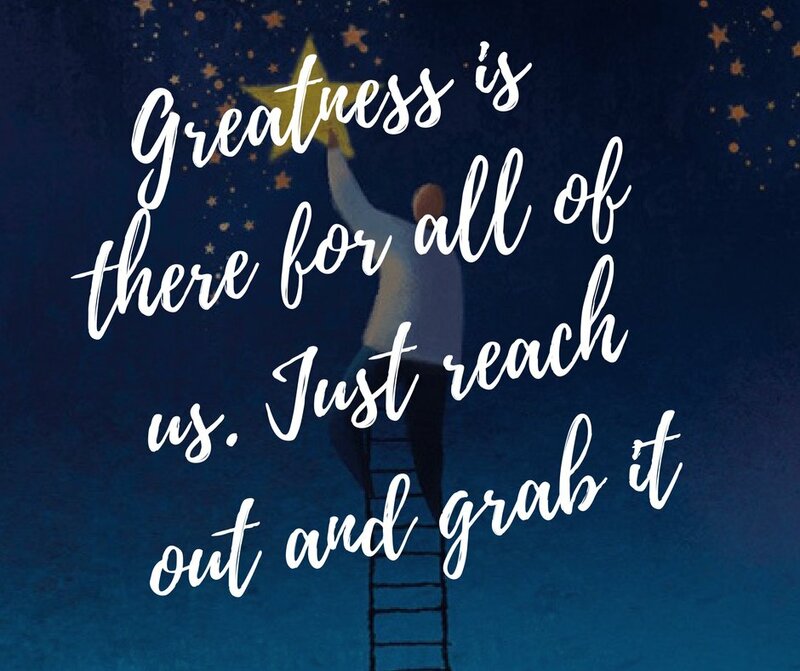 Every time you reach out to another person, a student, and support them, treat them with kindness. You've taken a step toward greatness. 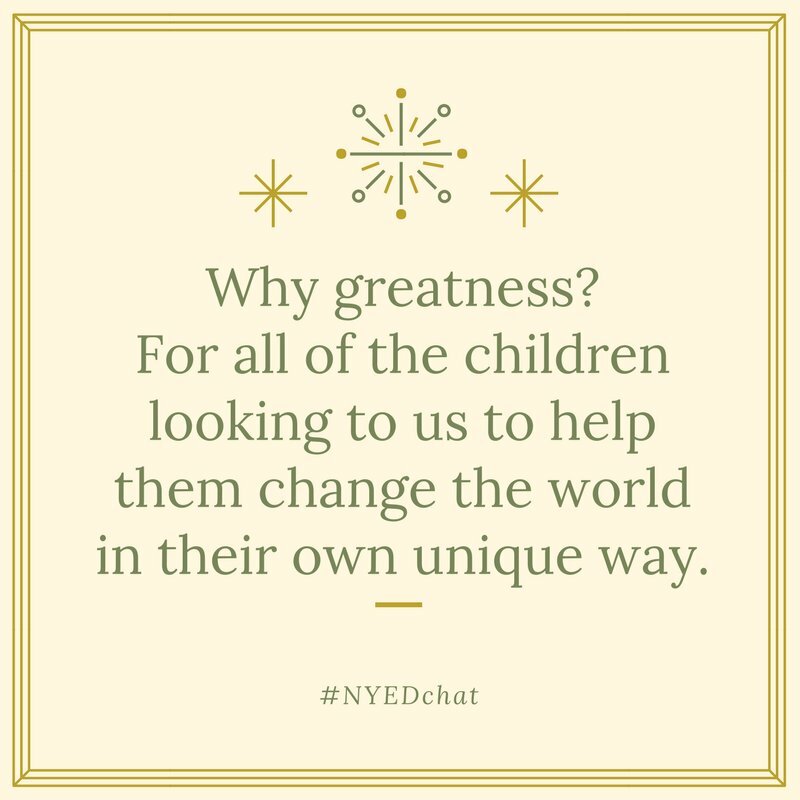 Thanks to the unwavering support and preparation of my all-star team of Laura Robb, Evan Robb, Dr. Mary Howard, and Dennis Schug, we planned, delivered, and lit up Twitter with powerful and inspirational statements from a "tribe of tweeps". 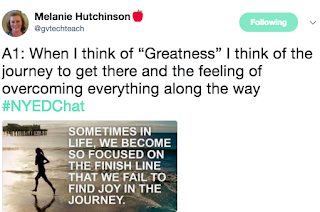 Finding greatness is an ongoing pathway and what better way to walk the path than with like-minded professionals committed to impacting teaching, learning, and life. 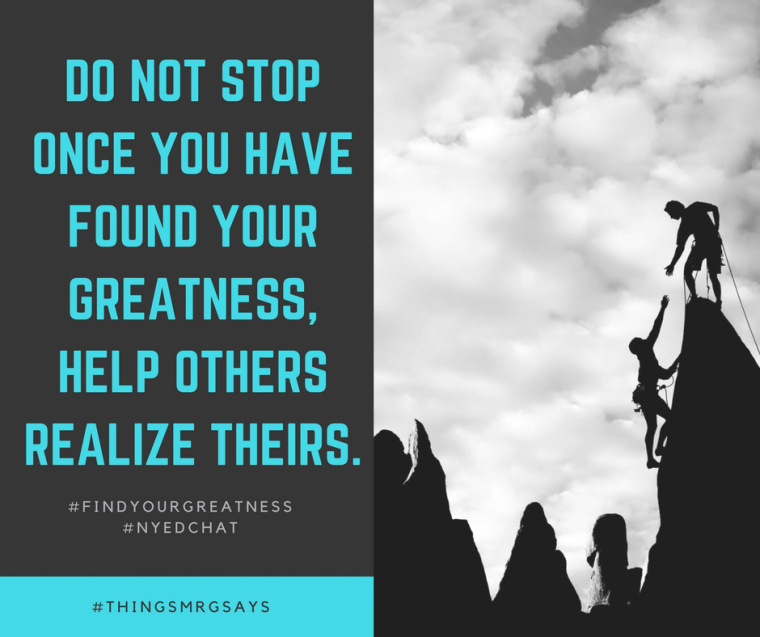 Since I could not capture all of the amazing quotes and digitals, please leave your blog links, digitals, posters, and inspiration in the comment section for all to see how #NYEDChat's tribe of tweeps are finding their greatness. In closing I leave you with a few digital inspirations to ponder. 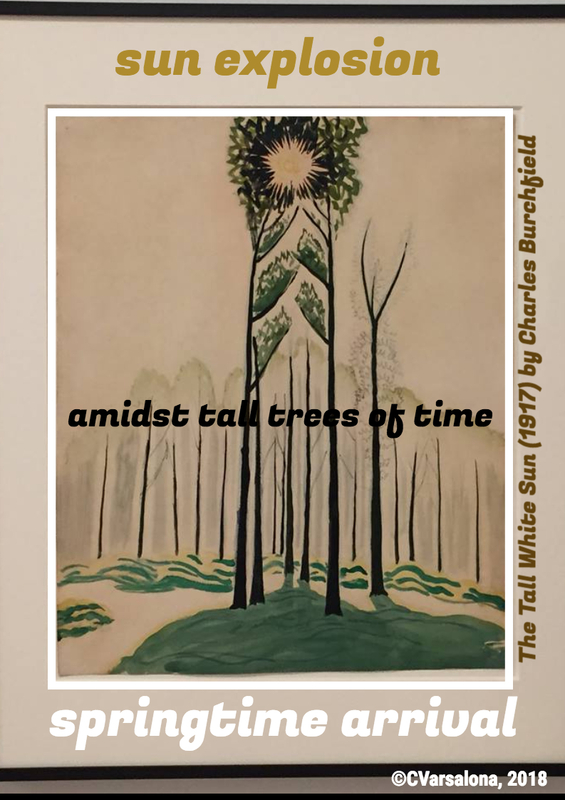 While creating this haiku for the 6th Annual February Poem Project started by Laura Shovan, I had pen in hand for quit a long time. The ideas swirled in my head like the colors of the unknown artist's artwork. As I pondered, thoughts flowed and spilled onto the page. My first thoughts were weak so I scratched them out. I wrote again; read the words aloud; promptly crossed them out. A draft emerged. It begged me to stay. I acquiesced and did not scratch it out. Instead, I shelved it as a rhymed draft, just in case I wanted to see my early thoughts at another time. 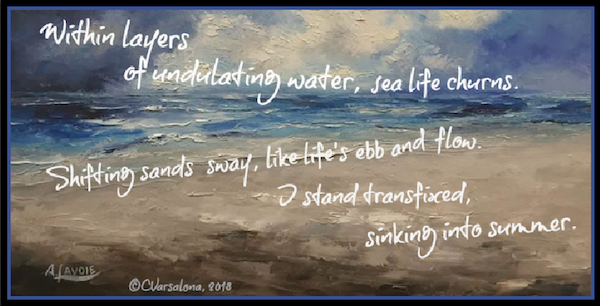 Playing with words, experimenting with design, and sitting back to view the image poem is all part of my process. Sometimes, I just wait and let the piece sit while I ponder its content. "Ready? Not quite, should I click the send button? Whoosh, off it goes!" 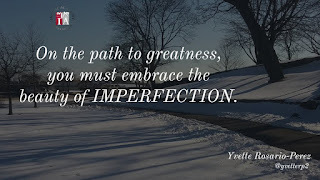 Being vulnerable is part of living the writerly life. I grow as a writer when I send out my post across social media and wait patiently for critiques to come back to me. 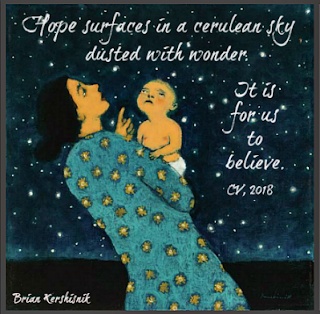 Since hope is my 2018 one word, I am embracing it on this year's writing journey. In the meantime, I will continue to pensively ponder, write, and proudly announce that my blog post, The Writer Inside, will air at #TeachWrite tomorrow, February 20, 2018. 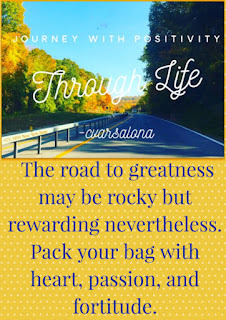 I offer this post to Two Writing Teachers for the Tuesday Slice of Life. Within any given week, the cycle of life takes us through a maze of activities and thoughts. At the end of the week, we need time to slow down and reflect. The words we use convey what we feel. 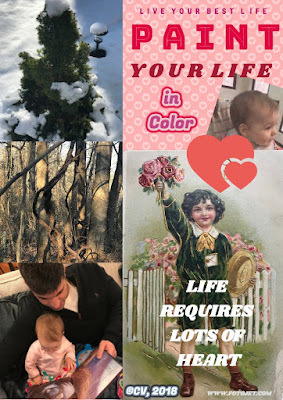 Today, I celebrate this past week through images and words inspired by life. 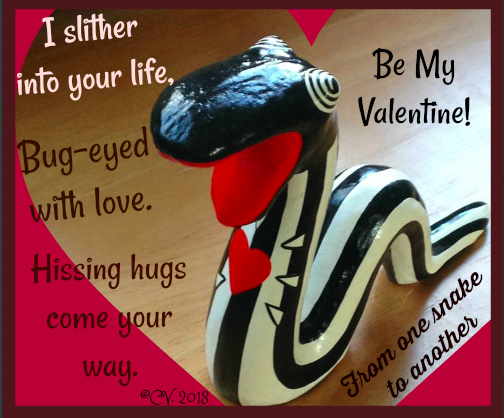 The week started with Valentine wishes. One little heart provided all around her with special smiles to lighten up a room. 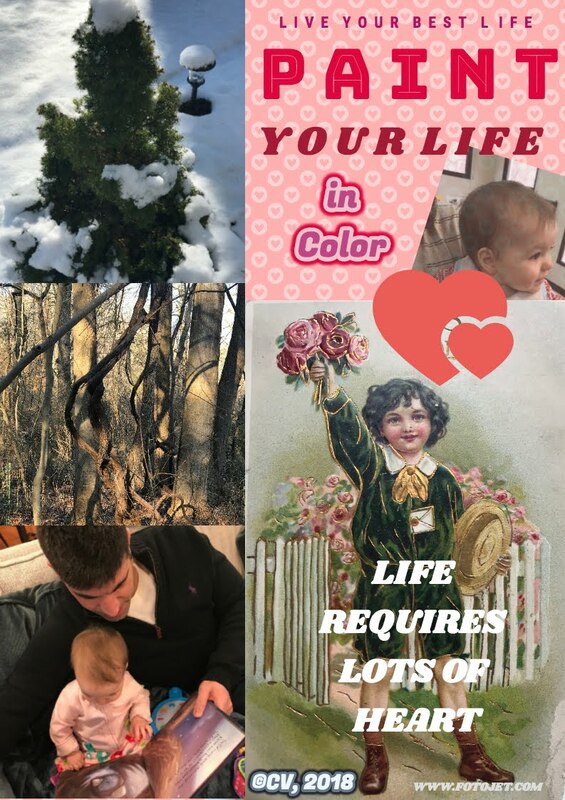 The grandbabysitting days in Virginia leading up to Valentine's Day were filled with memories to cherish. 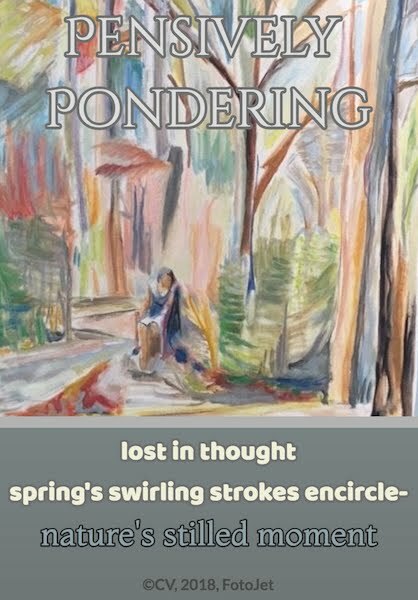 Upon return home, ekprastic poetry, writing to art prompts with Laura Shovan's writing community, was part of my daily practice. 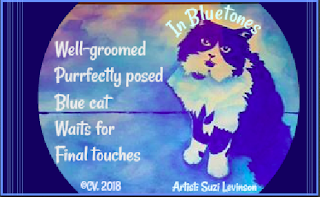 For those who love cats, this one is an artist's dream. Are you thinking springtime? Then, this image poem is for you. 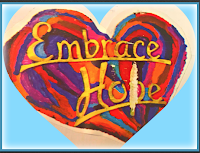 To close the week, I embrace hope as more than my one word but as my fervent guide to living a life painted in color. 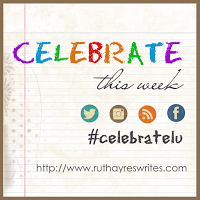 I send my thoughts to the Celebrate This Week site hosted by Ruth Ayres. Within our "writer band", we communicate powerfully through poetry. It is our bond, our vehicle that projects our feelings and voices out to the world. 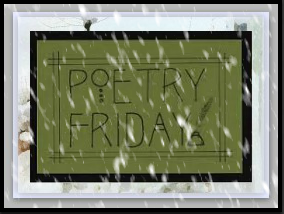 This month our writing community, under the direction of Laura Shovan, has been writing ekphrastic poetry daily. 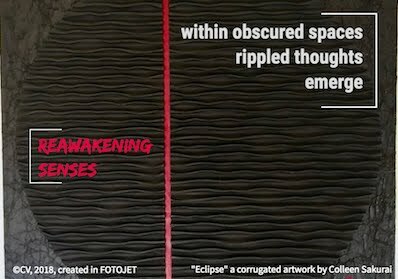 Today's post is based on "Eclipse" by artist Colleen Sakurai submitted by Holly Thompson. 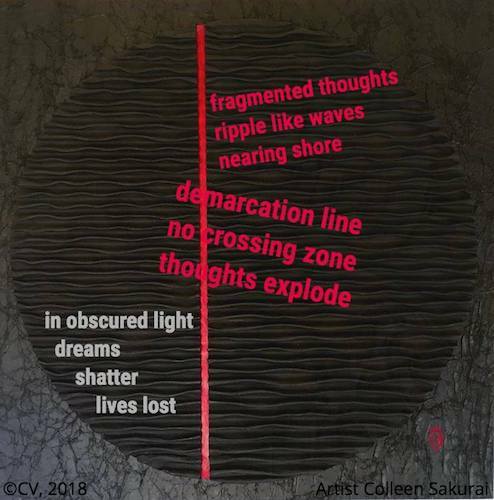 The above poem was written in response to Sakuri's corrugated artwork. 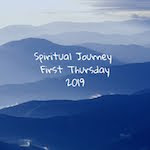 Part II followed after my yoga class that began with breathing exercises that would focus us, quiet the mind, and bring fragmented thoughts together. The practice certainly helped but upon returning home, I turned on the midday news. I could not help but be saddened by the number of deaths and injuries related to the Parkland shooting. My thoughts started to race. Why are some students driven to violence? Why is there a rise of horrific happenings in today's public schools? 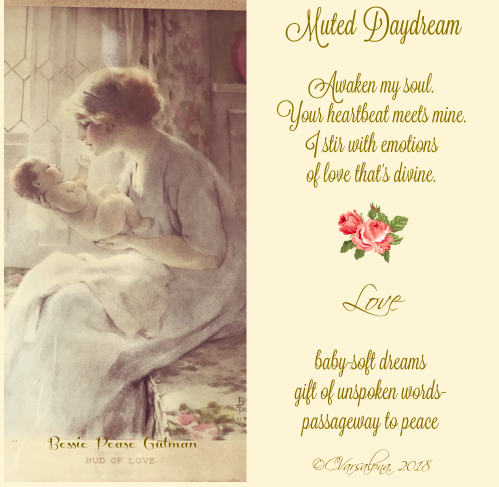 I sat down to write to bring light to my fragmented thoughts. Some of the other writers in the community also decided to focus their attention on the sheer horror of rising student violence. For #ParklandStrong, I offer my thoughts and prayers. 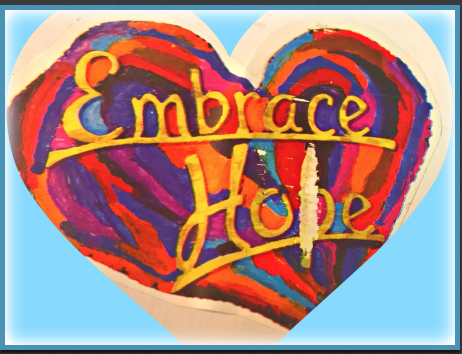 Change is needed but where do we begin to harness the power of hope? The #KindnessMatters initiative is a start but so much more is needed. What are important next steps? 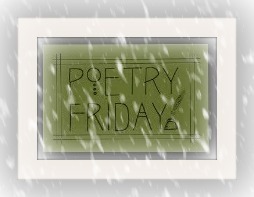 Tonight, I am joining the Poetry Friday Round-up here. Jone MacCulloch is graciously hosting the round-up this week. 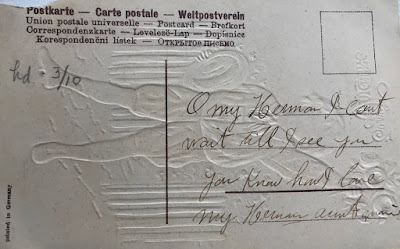 She is also offering her students poetry postcard event. This marks the 10th annual poetry happening. 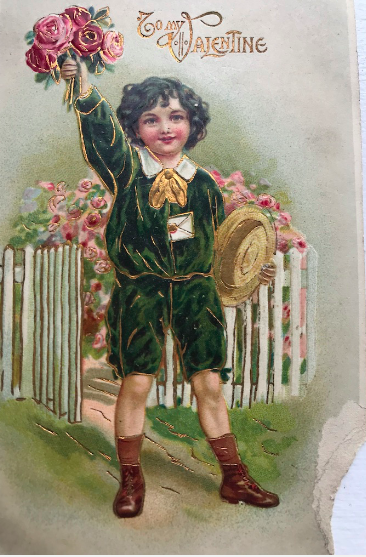 I send greetings to all in my writing community. May Cupid pierce your heart with love! 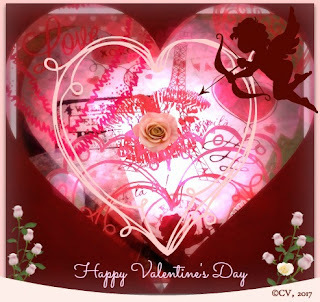 Cupid certainly has pierced mine. My layered valentine was inspired by early 20th century penny postcards in my ephemera collection. 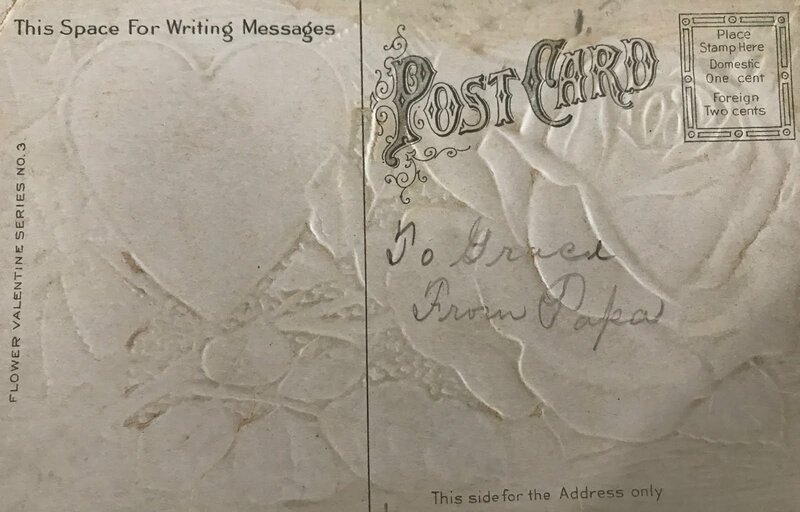 I love to share the script on the back of my penny postcards. 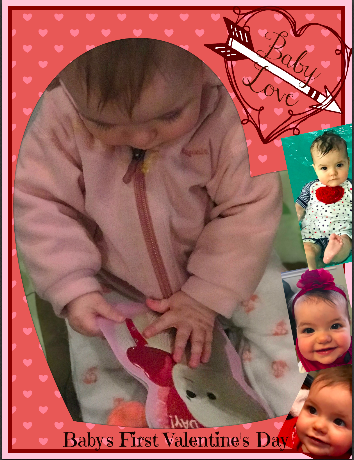 Grace must have been so happy with this penny postcard from her Papa. I had fun creating the valentine poem below from an art prompt provided by Diane Mayr in the 6th Annual February Daily Poem Project started by Laura Shovan. 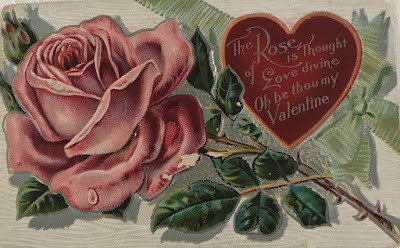 Perhaps, you will find this valentine humorous. I am off to read what other slicers have written. I spent this week at home recuperating from implant surgery and a nasty sinus infection. Since my voice was hoarse and sore, I was advised by the ENT to stay quiet. That seemed to suit my family just fine but I had a workshop on Tuesday so I had no choice but to rest before working with the high school teachers. My foggy brain had to rally so with hot tea, honey, my slide presentation, and five boxes of contemporary books compliments of Scholastic, I was off and ready. 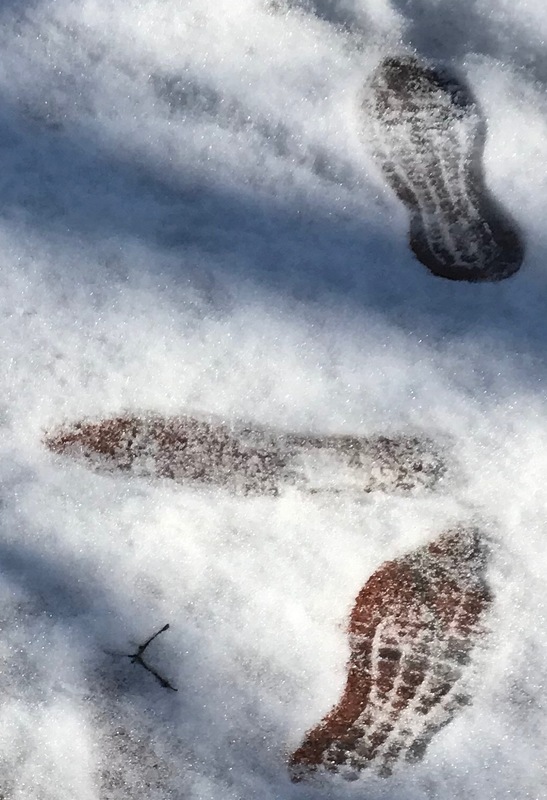 The wondering began at 3:00 pm on Tuesday. The teachers and I explored how to engage the high school students in deepening their awareness of argumentative writing. I was so thankful that I made it through the presentation without a coughing attack but then when I thought everyone left the room, the nagging cough started. Water poured from the corners of my eyes and nothing seemed to stop the flow. Little did I realize that there were two teachers in the room. They kindly asked if I was okay. Clearly, I wasn't. Was I more embarrassed or fearful that the coughing would not stop. I knew I needed to go home and rest so I packed up as quickly as I could and went to the follow-up meeting. Would you believe that it took me an entire day and a half to regain my voice? 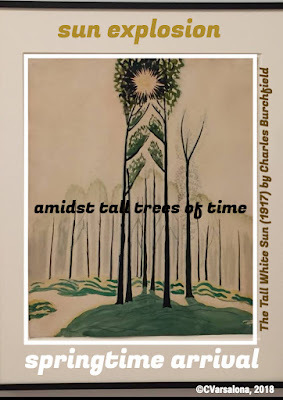 Within that time period, I challenged myself to write ekphrastic poetry for the 6th Annual February Daily Poem Project created by Laura Shovan. Each day, I noticed, wondered, and attempted to write to the daily prompts that centered on artwork in the home. 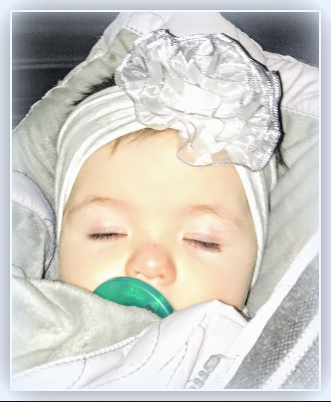 Unfortunately, my foggy brain was affecting the way I wrote but thoughts of visiting my grandbaby for Valentine's Day kept me wondering and writing. This weekend, I will read the poem above and the one below to my little grandbaby and see if she has a warm smile for me before she falls fast asleep. Thank you Ruth Ayres for providing the space at your site to Celebrate This Week each week. I am on my way to Virginia and will check in after this weekend to read the celebrations from friends. In the meantime, I hope everyone celebrates the small moments each day.